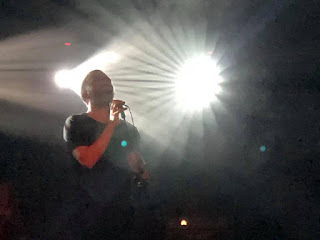 The UK leg of The Slow Readers Club's first tour since signing to Modern Sky kicked off at Birmingham's O2 Academy 2 on Saturday night with a set full of fan favourites from their first two albums and four tracks that should appear on their third album early next year. Support came from the impressive Victories At Sea. Being signed to Static Caravan is pretty much a guarantee of quality and Victories At Sea do nothing to dismiss that train of thought. 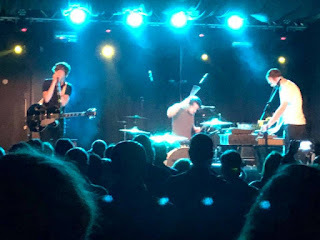 They're a local band (although they're also doing the Glasgow leg of this tour) and they've brought a few fans of their own along and as their set progresses they win over a few more too. The three piece trade in big ambitious and dark electronic sounds through which pierce hooks that draw the unaware listener in. At times they're actually a bit too full on for this room that feels like an afterthought to the main Academy as their thumping electronic bass lines reverb a little too much, but that's the venue's shortcoming not theirs. They recall fellow Brummies Editors and recent tour mates The Boxer Rebellion in elements of their sound, but are smart enough to create and maintain their own personality and ethic in their songs. They're definitely a band to keep an eye on. The READERS chants have already started before the lights go down as the sense of anticipation builds. Despite Birmingham not being a city they've played in the last year and a half, something Aaron references by mentioning The Sunflower Lounge where they pulled around 30 people to their last gig here, they've got a packed, if not quite sold out, room to play to tonight. The sound issues seem to be ironed out as The Slow Readers Club sound as good tonight as they have for a long while, particularly Aaron's voice, which has improved immeasurably over the past two years, the lyrics given added depth by emphasis on certain words and a much wider range and emotional control. It's evident right from the start of opening song Fool For Your Philosophy that the whole band are supremely confident right now, buoyed by the ever-expanding size of crowd they're pulling and the response they're getting to new and older material alike. One look around the room and you see people singing along to every word as if they're recanting their own life story, and in a way, that's what The Slow Readers Club do. These are dark, personal songs, but one's that people can relate to their own circumstance and that's why they make such an emotional connection. Take new single Lunatic where Aaron declares "hard to find a fit, because I know that I'm a lunatic" and there's a few hundred mouthing the words in unison. It's something that happens throughout the evening and why they now stand on the edge of a breakthrough that wouldn't have seemed possible just eighteen months ago. The other three of the four new songs seem set to cement that position. Not The Only One lifts as the lines "I can hear the choir singing, how they long for new beginnings" with a shade of optimism, Through The Shadows echoes this feeling, but it's Open Up My Heart that feels like it might be "the one" that makes them the real breakthrough. It's a huge soaring anthem with a hook that's guaranteed to embed itself in your brain leech-like, and the line "believe enough to lose control, where there's love there's always hope" is one you, and thousands currently oblivious to the impending arrival of this earworm, will find yourself involuntarily singing to yourself. The songs the audience are more familiar with, and that list of singles off Cavalcade - Forever In Your Debt, Start Again, I Saw A Ghost and Plant The Seed - seem even more impressive by the week when you consider the situation out of which they were born. They're sung back with a gusto that almost shocks this modest four-piece. Even the first album favourites - One More Minute, Sirens, Feet On Fire and Block Out The Sun - are greeted with the same reverence, testament to the fact that once they've grabbed you, The Slow Readers Club don't let go. By the end of the night we leave convinced even more that the rise of The Slow Readers Club has gathered a momentum now that's unstoppable. Armed with a new album, a record deal where they are in all likelihood the label's main band, the first seeds of serious daytime radio play and a growing dedicated fan base, 2018 looks to be an even bigger and better year than the last two. The Slow Readers Club played Fool For Your Philosophy, Sirens, Start Again, Lunatic, Not The Only One, Grace Of God, One More Minute, Feet On Fire, Plant The Seed, Through The Shadows, Block Out The Sun, Open Up My Heart, Know The Day Will Come, Cavalcade, Forever In Your Debt and I Saw A Ghost. Victories At Sea are on Facebook and Twitter. 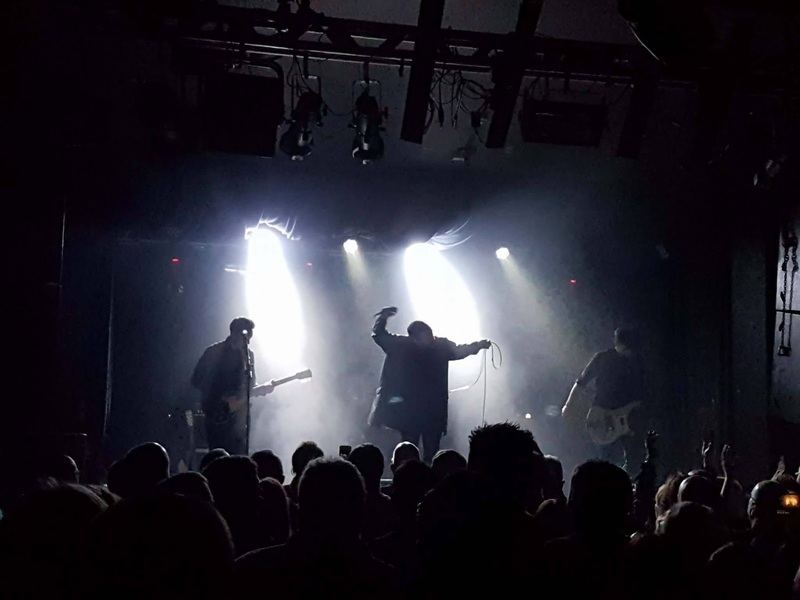 In addition to supporting The Slow Readers Club in Glasgow on December 9, they play Manchester Night People on December 8. You said 'not quite sold out'. Actually they sold out Stage 3 and had to move to Stage2! Fans wanted a longer set too! 10pm was far too early for a gig.